The piece is dedicated to my friends Korin and Daniel (Ko-Da), they both have internship with Odyssey Chamber Music Series here at Columbia, MO. 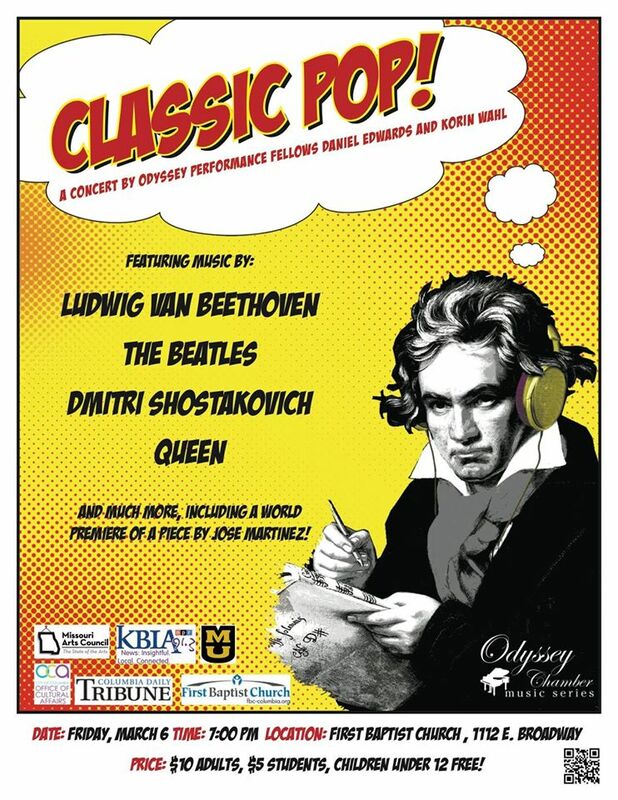 They put a concert together titled “Classic Pop” with the idea that classical music was one day very popular and appealing to huge amount of audiences. They will be playing together with my piece selections of classical music that will rock the audience and arrangements of pop tunes that are very popular. Opera was back then the main event and if a guy was interested in a girl, well…”let’s go to the opera!”, now we go to the movies . Families used to have subscriptions for the local orchestra to go during the weekends because they’d play appealing programs, now we have Pandora, Spotify and Netflix (even Berliner Philarmoniker has the Digital Concert Hall, but that’s a different story). Before composers were the leaders of the musical tendencies and well if you wanted to know what was the latest trend, you had to go to concerts! but then we got recordings and afterwards videoclips you don’t need to go to concerts because we have it all there. It sounds to me like classical music just didn’t adjust to the changes but still people needed entertaining and then got it from different places. Other artists—perhaps not as well academically prepared as the ones from the schools, but at the same way talented and communicative—took over this means of communication and spoke to the people the way they needed to. They gave people what they wanted, they spoke in their tongue of contemporary necessity and people loved it. We all love it when an artist expresses with his music or painting that thing we have like a knot in our throat and cannot tell. However I feel that all the separation from the duet audience—composers that took place during the 20th century was absolutely necessary otherwise all the technical developments that were created would have been never possible. We needed composers to work only for themselves incubating all those rational procedures that became art itself and that have an unmatchable amount of coherence. But will the audience notice all of that without the corresponding lecture that unfolds all the mysteries behind art? Definitely no… but we all have enough with the phrase “they won’t understand but they will feel it”… will they? I think they definitely will. My piece is a attempt to put together ideas coming from both—the sometimes irreconciliable—fine art and popular music. From the popular I took danceable rhythms and from the fine art the idea of developing materials in a less spontaneous way. From the popular I also took the structure that is nothing else than an imitation if the structure of any mainstream radio (in fact my reference were Bruno Mars’ “Uptown Funk” and “any song” by Coldplay), verse, pre-chorus, bridge, chorus (multiple repetitions). From fine art the idea of dropping out some beats in a repetitive pattern to make it less danceable but still catchy (although dropped beat is also a big thing in country music!). It’s a delight to work with friends specially when you get to be passionate about the same thing! My friend Korin has hispanic heritage as I do and Dan is crazy about Spanish language and Latino culture. This encouraged me to use a lot of licks in the music coming from the tradition of Charanga music, where string instruments are the leaders. Korin and Dan will show some chops! Join us for a concert full of different nuances coming from all times and several cultures, Support the local artists! This piece started in a conversation with my friend Joe Rulli—MM in saxophone performance at MU—where we realized the lack of pieces for saxophone quartet with the Latin American culture. Milhaud’s Scaramouche and his exotic third movement is well known but we both think the sax quartet is in need of something similarly colorful but with a newer perspective. With this in mind we started the ambitious project the fill in this gap. I started then by thinking that we have in Latin America a particular and common duality in our mindsets, in general we all share a cheerful personality and at the same time people live in such shortage of several basic needs. As a paradox my own country was declared the “happiest country in the world,” well, I (and many more) don’t see how it can be so, but I do see that no matter what the population looks towards a better future and lessens the problems just to take a break and be able to live (or survive). The idea of creating a portrait of these emotions came to my mind and I decided to make it in five short parts that are a sonic personal reinterpretation of different influences, impressions, and reflections of the situation afore described. These portraits are uneven because once passed through my filter they were modified and reorganized and because a portrait is always a personal statement of an unequivocal reality. Three movements are titled Cycles and are inspired on patterns and melodies coming from different popular music form Latin America. Cycles I – A sound of a Night is related to salsa and to nightlife that surrounds this music. Cycles II – A Sound of a Prism is also related to this popular rhythm but also has influences from progressive rock. The rhythms on which Cycles III – A sound of a Mountain is based on can be found in several types of Latin American popular music that utilizes the 6/8 time signature. Victims is an homage to the 5.405.629 victims of the conflict in Colombia (counted from 1985 to 2013 by the government and the magazine Semana, check this link to know more). Absences is related to the emptiness and sadness these victims left behind. The piece will be premiere by my friends of the Saxophone quartet Elision under the guidance of Mizzou Saxophone instructor Prof. Saguiguit. The performance is part of the 2015 Conference of the Region 4 of the National Saxophone Alliance NASA in Norman, OK. Other premieres and wonderful performances will be held in this event it will be an exciting overdose of saxophone music for my ears!